Improving the effectiveness of treatment and quality assurance applications calls for a systematic framework for representing how treatment works. In order to disaggregate the ingredients underlying treatment retention effects, better assessment and d namic process models are required. 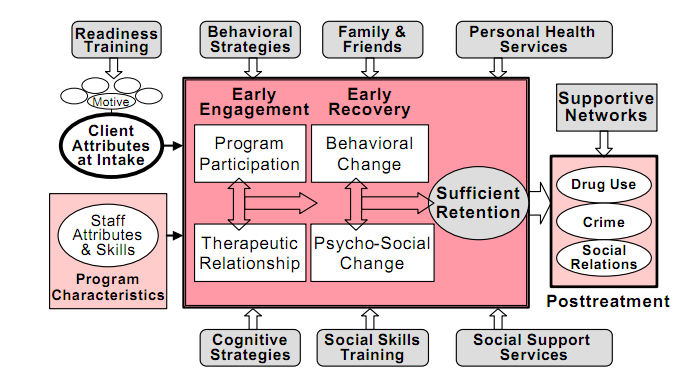 Multivariate analytic models tested in a variety of community and correctional settings have helped to establish more clearly the directional relationships be tween client motivation, treatment process variables (i.e., therapeutic rapport, program participation, behavioral compliance, and psychosocial improvements), retention and follow-up outcomes.